Of its first restaurant in the historic city of Canterbury, GBK’s development director, Stephen Evans, said the company had been attracted to the city by its mix of tourists and students. 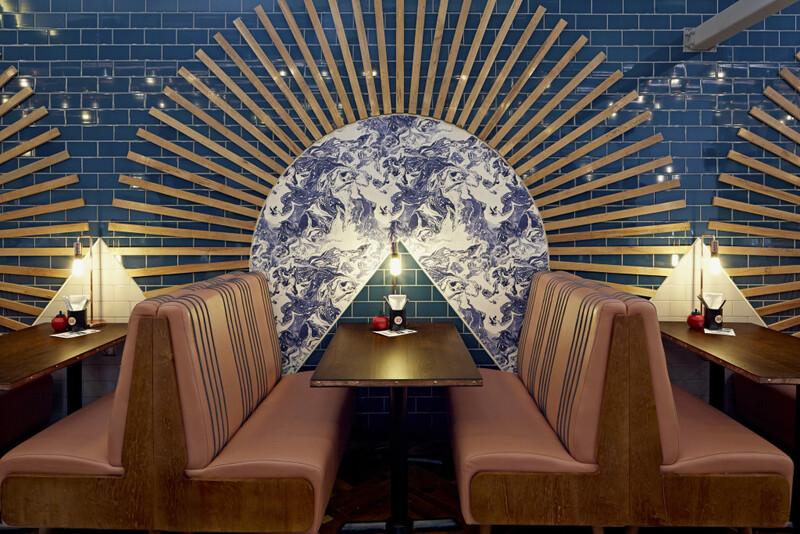 With the presence of so many established competitors in the city centre, not to mention rival newcomers, GBK turned to Moreno Masey to give them the edge in terms of interior design. 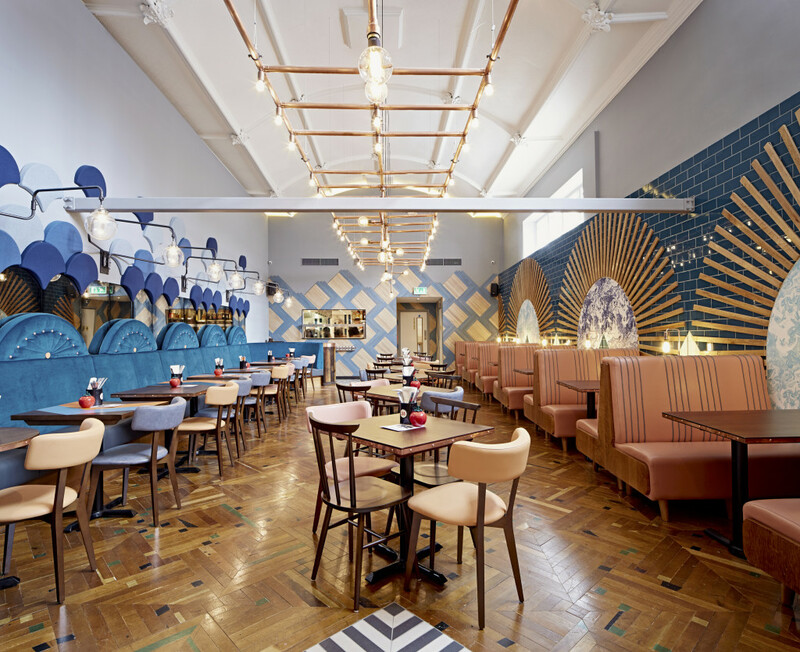 Taking over the old Picturehouse premises in St Peter’s Street, GBK’s new restaurant uses stunning interior visuals and seating to grab the attention of locals, students and tourists alike amid the proliferation of restaurants in Canterbury’s city centre. 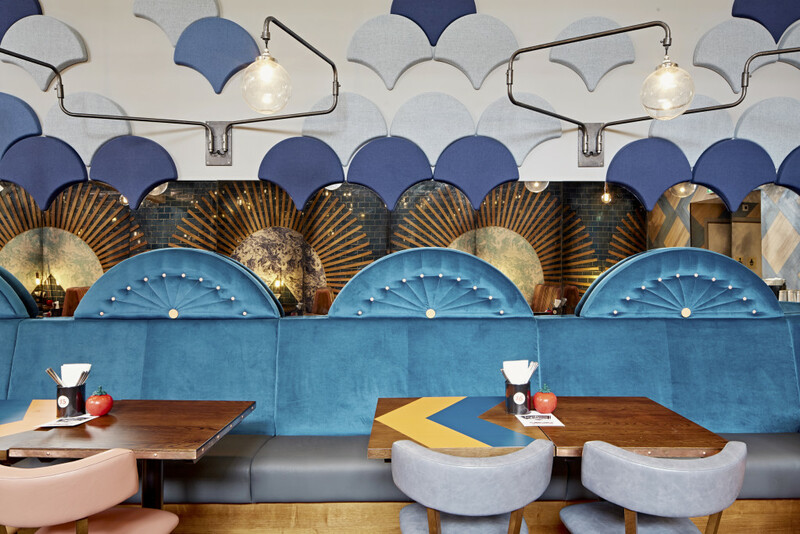 Lavish and sumptuous seating with arced panels topping the seat backs, all in a stunning blue velvet, give a majestic air to GBK Canterbury. The radiating stitching mirrors the spoked design reflected behind them, a feature of the opposing wall. The seats themselves are in a complementary dark grey from Yarwood’s Camden range. On the opposite side of the restaurant Craftwood’s plain back booth seating with contrasting piping detail forms an integral part of the design, blending with the effect created by spokes radiating from the focal disc and triangle motif. Even rival restaurateurs saw GBK’s presence in the city as a sign of its growing standing as the culinary capital of Kent. Helping to cement Canterbury’s reputation as “the place for foodies in Kent”, as the Canterbury Times put it, GBK greets diners with an impressive interior, a visit a visual treat as well as a culinary one, the superlative visual designs and aesthetics realised by Craftwood’s dedication to the designer’s vision.